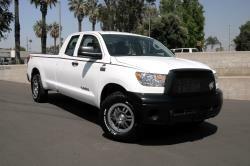 While most modern fullsize trucks and SUVs offer amenities like multi color mood lighting, more soft touch points than a padded cell, and tiny 10-turbo engines that claim to return better gas mileage than a bicycle. The Toyota Tundra and Toyota Sequoia are blissfully devoid of all these things. It's a Toyota, and it's a truck. What more do you need? Capability and reliability comes standard on the 2007-2017 Toyota Tundra & 2007-2017 Toyota Sequoia. And you can probably enjoy all of the fancy nonsense that it lacks, on your next "spa day". Sure, they aren't butched-up lounges like your neighbor's F-150 or Yukon. But it's a Toyota, which means it will handily beat those domestic fullsizers in dependability and resale value. You can however, get more horsepower and torque from your truck's Toyota 1UR-FE 4.6L V8 or Toyota 3UR-FE 5.7L V8, with an AIRAID 510-340 MXP high performance intake system. Like all gas powered engines, your Toyota V8 makes power by burning a mixture of gasoline and oxygen. The energy that's released during the combustion cycle, forces each piston to turn the crankshaft and send rotational energy through the flywheel to the transmission, where hydraulic pressure turns the driveshaft and moves the truck. Oxygen acts as a catalyst for the detonation, so the number of oxygen molecules in the air charge will have a direct impact on performance. 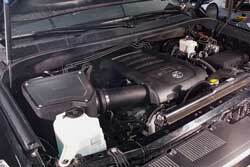 Unfortunately, the OE Toyota Tundra intake system has numerous inefficiencies built right in. 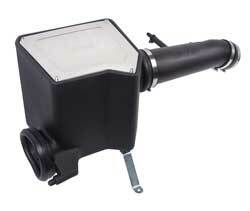 For example, the intake tube has a tapered shape, with irregular, corrugated inner surfaces. And the air box only lets in a small amount of air, then forces it through a thick paper air filter. All of this causes the air to become turbulent, elevating the temperature and lowering the oxygen content. The AIRAID 510-340 MXP high performance intake system on the other hand, is designed to increase engine airflow, so it can make more horsepower and torque without modifying the Tundra 1UR-FE 4.6L, or Tundra 3UR-FE 5.7L. In order to reducs airflow restrictions, the AIRAID 510-340 MXP cold air intake system replaces the the entire Toyota Tundra intake system, and you won't have to make any underhood modifications to install it. In place of the stock air box is a special high-flow AIRAID MXP air box that pulls more air into the system through the factory inlet hole in the fender. The stock intake tube gets ditched for a low restriction AIRAID intake tube, that has a smooth inner surface to reduce air turbulence (it also has fittings for the factory sensors). The air that this Toyota Tundra performance intake system delivers, first gets cleaned by an oversized AIRAID performance air filter. Unlike that thick paper OE Toyota air filter, the high-flow AIRAID Synthaflow air filter is made from a low restriction cotton gauze and synthetic material that lets more air in, while removing more airborne contaminants before they can reach the engine. The 'depth loading' filter media traps and stores dirt inside a web of oiled fibers, which allows more air to flow through as the miles rack up. The end result of introducing a high volume of cold air to the motor, is an estimated increase of 9-hp & 10 lb-ft of torque.